Four new student papers and presentations are now posted on the spring 2011 class home page as PDFs and on-line videos. The titles of the student projects are listed below, along with the embedded video of their 10-15-minute talks. 1) Rough seas. The was nothing quite like sitting on the trampoline, rising up on the crest of a large wave only to watch with mild horror as the water simply disappeared underneath you for a minute before rushing up to soak you before you had a chance to even comprehend what’s going on. Rough seas were also fun in the cabin. Whenever Captain Todd yelled in, “You might want to hold on and secure loose items,” a frantic response was initiated as everyone rushed to grab onto their possessions. Then the boat pitched and wreaked more havoc on the galley than a small earthquake. Sure, it could be nauseating. But as long as your computer didn’t crash to the ground (which did happen on more than one occasion), you couldn’t help but laugh. 2) Sitting out on the trampoline. It was definitely my favorite place on the boat. It was also a great place to nap. It was so relaxing sitting out there, scanning the water for whatever might be out there. 3) How sweet chocolate tasted on the boat. I swear, chocolate never tasted so good. Especially those NOLS malt balls. 4) Finding shrimp swimming around in the toilet. I kid you not, it happened. Then you’d have to scoop him out because you didn’t want to condemn him to a miserable death in the sewage tank. 5) Stirring up the water out the escape hatch at night and watching the Noctiluca produce bioluminescence. 6) How gorgeous the stars were every night. 7) Calling every whale watch operator we could think of in the morning in a desperate attempt to find the whales. These calls would sometimes turn into very pleasant chats, and we all made friends with the operators. 8) Being able to plot our own course every day. 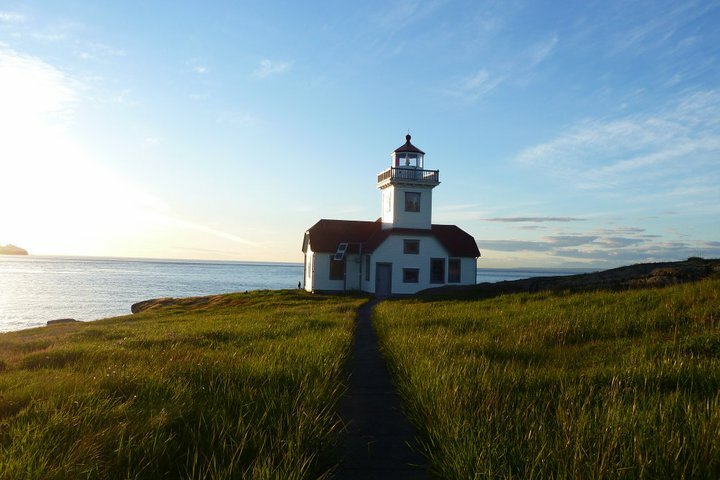 If we wanted to go around Whidbey Island, we could. And did. 9) How good a hot shower felt after a week of feeling cold and dirty all the time. 11) Discovering new plankton names that sound like dinosaurs. 12) How cold it was every night… oh wait, no I won’t miss that. 14) How beautiful everything out here is. 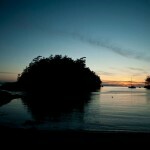 We had the opportunity to visit so many awesome places, from Deception Pass to Active Pass way up in Canada. Each adventure was more exciting and beautiful than the last. 15) Home-cooked popcorn. Who knew it was so much better than microwave popcorn? 17) All the amazing people that I met. I’d like to give a special thanks to all of the guest speakers that took time out of their busy schedules to meet with us. It’s been amazing. Also, to Ally, Emalie and Kelsey for helping to make this experience fun. I’ll miss them all terribly, and hope that I’ll get to see everyone again sometime in the future. This program has been a really great opportunity. 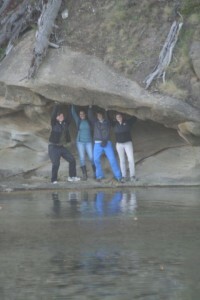 It has given us an intimate taste of what field research is like, and has definitely helped me to shape my future path. We’ve all learned so much, and I’m excited to be able to share this newly acquired knowledge with others. For a really great video on Beam Reach made by our fantastic videographer, Carlos, check this out. It’s a good summary of our experience. I’ve wanted to study whales ever since I was three years old and first watched the movie ‘Free Willy’. I was extremely lucky to get the opportunity to actually do this. If you ever get such an opportunity to follow your dream, go for it. You never know what you might find. Today was the last day of Beam Reach! We have all worked so hard to get to this point and I think our efforts have paid off. Our presentations went smoothly and we immediately dispersed to our families and homes that are all across the country. I decided that my last blog should be a summary of my independent project of the course because I have failed to mention it so far. 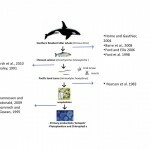 My project looked at the ecological significance of the Southern Resident killer whales. When looking at the trophic interactions that are involved in their food chain it is apparent that bottom up analyses is understudied. Most people seem to look at top down control of the Southern Residents such as what negative impacts are directly affecting the whales. Not many studies seem to focus on how primary productivity affects their population. 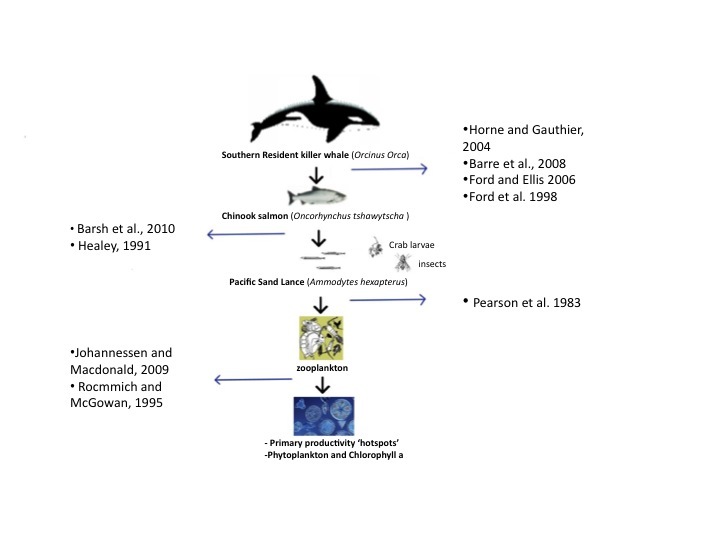 Here is a graph I used in my presentation that illustrates the trophic interactions that are involved in the Southern Resident killer whale food chain. The Southern Residents are known to primarily eat chinook salmon. Chinook salmon eat forage fish. The forage fish eat zooplankton and the zooplankton eat phytoplankton. These interactions led to my hypothesis trying to find a linear relationship between primary productive ‘hotspots’ or areas of high amount of phytoplankton and presence of fish. My sample sites were on the west side of San Juan Island and over Salmon Bank. I concluded my project and presentation with insignificant differences between phytoplankton abundance between sites and the absence of large targets. This does not mean that there isn’t a linear relationship between the two. It implies that environmental factors that can drive variation in phytoplankton abundance within our transect of study was insignificantly different between sites. Therefore future methods were suggested to contain another transect with different tidal patterns so primary productive hotspots or significant differences in abundance of phytoplankton could be found. If anyone wants to look at each of our presentations you can go to the beam reach website at http://www.beamreach.org/class/2011-spring and our talks should be up there soon! Well this is it…have a great summer everyone! I’m sure you all are wondering if we’ve seen any whales these past few weeks. At this point I’m thrilled to say we have seen them more than a few times! Initially, it seemed that the whales were avoiding us or at least choosing the exact opposite direction and side of the San Juan Islands in relation to wherever we were. Days past with this sense of disappointment but determination kept us going. 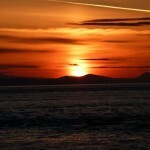 Our lingering hope led us to venture far into northern and southern parts of the Salish Sea. One day, we travelled up to my favorite island so far; Patos Island, in hopes the reported killer whale’s up in Pt. 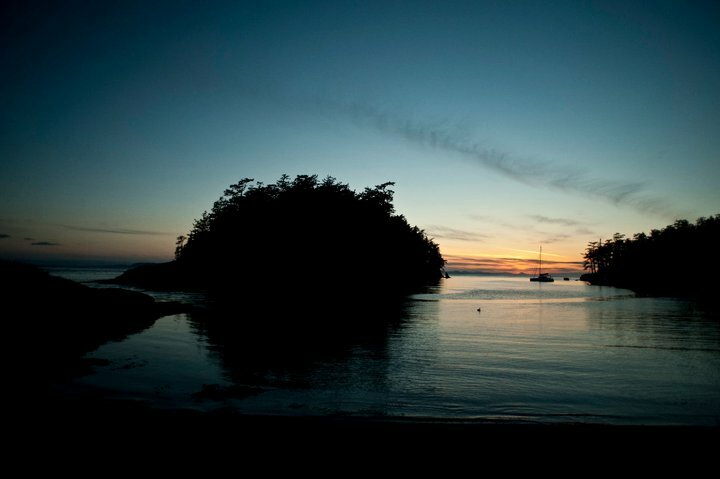 Roberts, Canada would continue on one of their annual routes down south between Patos Island and Eagle Point. After taking night shifts listening to underwater hydrophones that are located throughout the islands we woke up the next morning knowing that they whales hadn’t passed our location. The day ended with news the whales were transients and going at a slower pace then expected. We were unable to see any whales that day, but our efforts continued nonetheless. Another day we travelled an even farther distance south around Whidbey Island. Supposedly we were the first Beam Reach course to go this far south! We had heard that J pod was seen down in that area so we spent the day looking and found gray whales and a breaching Minke instead! This is very rare to see a Minke breach so our long trip down ended up being worth the time and fuel used. I feel like I haven’t explained how exactly we go about finding the whales. I make it sound as if we use underwater hydrophones as our main locating source, but this only half of our method! One part is to check to see if killer whale call spectrograms were picked up from the Lime Kiln underwater hydrophone if necessary, or listen to the hydrophones that stream live on orca sound at http://www.orcasound.net/ to see if we can locate the direction the whales are travelling. Our other main locating source is communicating with people. 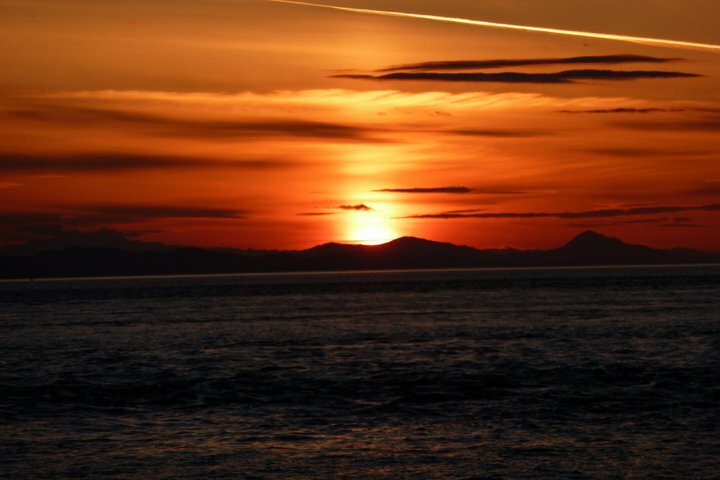 We keep in contact with land based observers, Vancouver, Victoria and San Juan Island whale watching boats, along with other companies such as the Whale Museum, the Whale Research Center, Sound Watch and Strait Watch. 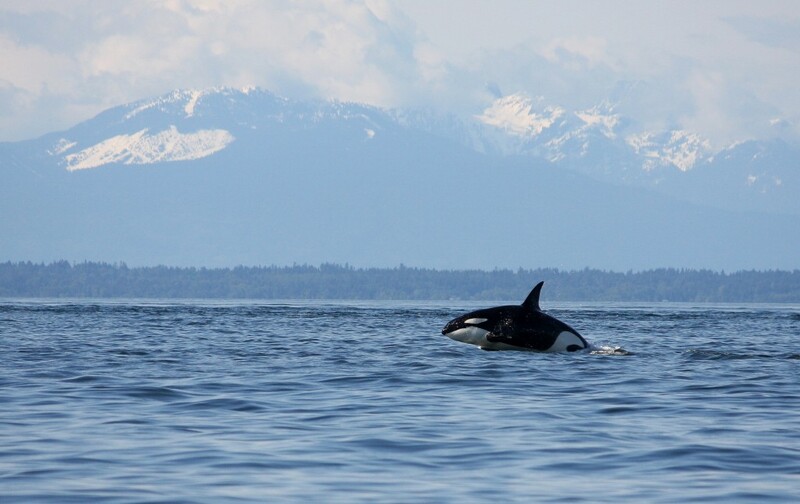 Each contacts purpose is either to educate boaters on vessel noise and how it can negatively impact whale communication, educate and entertain the public about their general biology or to continue research on the Southern Resident killer whale’s. All of these contacts serve as vital source for our knowledge of the southern resident and transient killer whale location. In order for us to create an equal sharing of information relationship with these contacts we try and relay any information of what marine mammals we see on our daily routes. There are exceptions when there is the concern of overcrowding the whales, so we make it a point to be very careful about who we relay the information to. 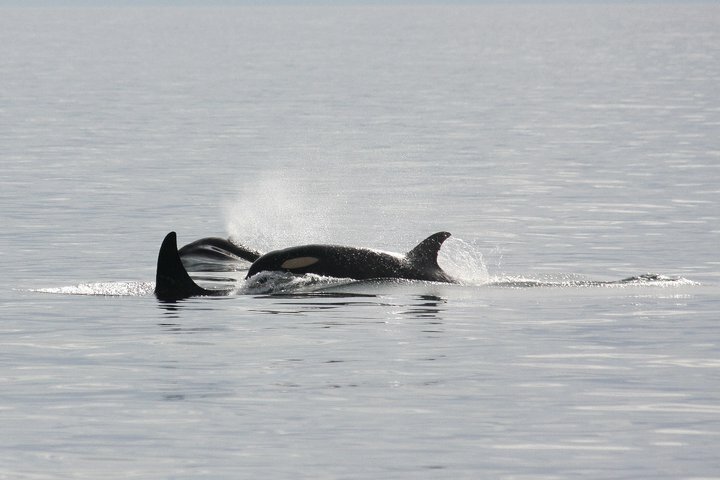 For the past 4 weeks the information we have been able to provide for others is actually not about finding the Southern Resident killer whales. 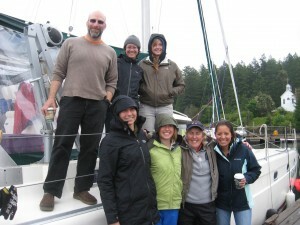 When pulling out of Snug Harbor along the west side of San Juan Island on May 8th. Ally spotted a humpback whale! Not only did we see a humpack whale but we caught them in a playful state allowing us to see the giant mammal breach multiple times! The amazing photo below was taken by our photographer/video-augrapher Carlos Sanchez. There was also pectoral and chin slapping that occurred. After our initial shock of observing a humpback breach not too far from our catamaran we called all of our contacts so that they could share in the enjoyment. That was the first moment we felt so good about giving information to our contacts instead of only receiving what they had to tell us. 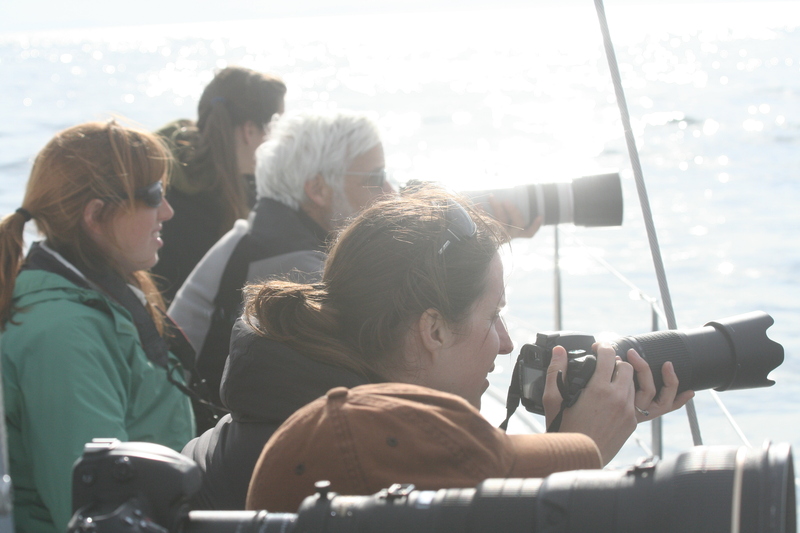 We have also seen the Southern Resident killer whales for 5 days total so far, and it was all possible because of this connection with other whale observers and researchers! Beam Reach is coming to an end. Before I got here, I never imagined how much would be packed into ten weeks. We have learned so much in science, sailing, and life. I will most treasure all the people we have met. From experts in the field like David Bain to experts in the kitchen like the talented Leslie Veirs, we have met so many new faces. The last two weeks on the boat we had two guests. Andrea Buckman came on board to tell us about her work with persistent organic pollutants (POPs) in both salmon and killer whales. Living in Canada, she focuses on the Northern Residents, but has been able to use her work to make predictions on effects of POPs on the Southern Residents. We got to give a little back by showing her J-pod! Always a treat. Unfortunately for our second guest, Julie Woodruff, we could not deliver the whales, despite all the positive energy we tried to send out. We still had a fantastic time. We were however able to have a discussion on communication on the bow of Gato Verde traveling through Haro Strait. We tried speculate why matriline group structure would be beneficial to the Southern Residents. Classes on the water don’t get much better than that! 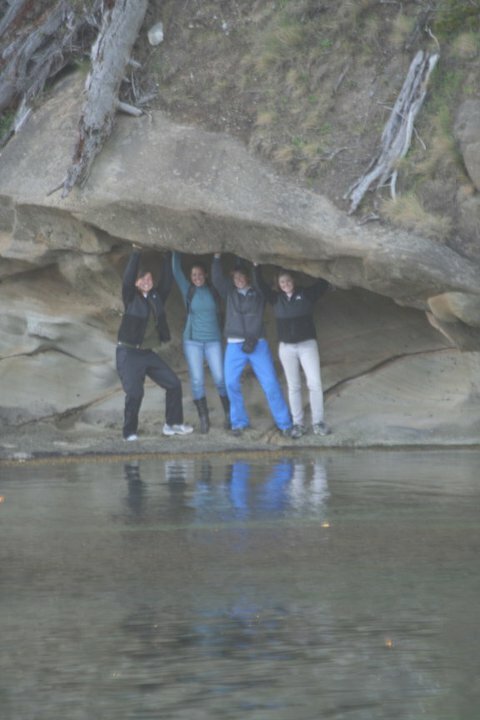 Julie is finishing her PhD at Berkley and has been coming to the islands to enjoy the whales and water for many years. She studies tuco-tucos, patagonian rodents, to understand stress in group-living and lone females. Our guests have shared their work and wisdom. We have been able to tie together many aspects of these whales lives. Thank you to all those who came to share their knowledge with us in these ten weeks. We couldn’t have done it without all of you. On the glorious day of May 10, 2010 we found the long awaited J-Pod and it was wonderful. We got to spend 4 hours with them and got some great recordings. Check them out Orca Recordings. The whole time we were surrounded by orcas, it was surreal. I can’t even begin to explain the level of excitement on the boat when we first spotted the whales. Whenever we spot the whales, we yell out their bearings with respect to the boat so we can better keep track of where the whales are. There were so many whales, we had one on nearly every hour of the clock! I never realized how big a creature can be until you see it in real life. Orcas are huge, not as big as a humpback, but when that black dorsal fin cut through the water, it rose to a stunning 5ft. It was amazing. During the last few days at the end of the third week at sea, we were beginning to question if J-pod was real. We had been out with vigil eyes, but had a better track record on land for seeing killer whales. Each and every time a report came in, it seemed we were in the complete opposite area. The Gato Verde is not fast, so each path has to be carefully planned out in order to find these elusive (well at least they were to us) animals. One evening we got word that they were in Active Pass. After mooring at Patos Island, we all took shifts staying up and listening to the hydrophone hoping to know if they tried to get past us. We got up early and headed just a bit north to wait for them to pass by. Unfortunately, they had not gone the way we had planned and had been sighted at Lime Kiln, a location we frequently visit. 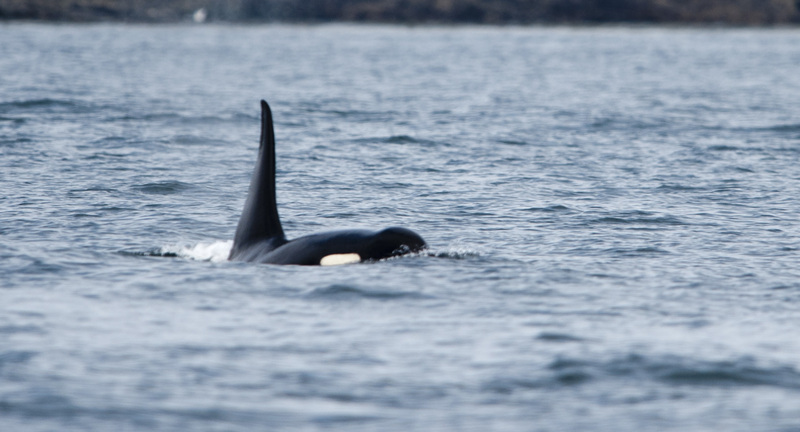 We were too far north to catch up and would not get our wish of seeing J-pod. This past Monday ended in us hearing word of residents, possibly J-pod, at Neah Bay. We were already stopped for the night, but tried to calculate when they would head our way. If they did decide to come into the area instead of going back out into the open ocean, it could take them anywhere from 17 hours to one and a half days. I was convinced we would get back to land and then be able to catch them once again from Lime Kiln’s rocky edge. Tuesday we headed to Lime Kiln. We planned to get some samples and do a sound spreading experiment in the area. Things were going great in terms of our science. Then, Val radioed us from the Gatito and said he had gotten a text claiming J-pod was close. I did not get excited because they were always close just never close enough. Mandy of course went into observer mode. To our surprise we saw several whale watch boats just south of us. 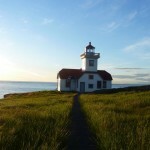 We packed everything up and headed down the west side of San Juan Island. Mandy then let out a high pitched sentence…WHALES in sight!!! Excitement filled the air as we got close. Suddenly two orcas surfaced on our port (left) side. The whale watch boats were spread out pretty far, so we continued further in. Eventually we found ourselves surrounded by these whales. We stayed there for hours and got great recordings from the vocal J-pod members that were all around. Slowly the small groupings left us. We headed back to Friday Harbor, since we were close and would be getting off the boat Wednesday morning. I still find it hard to believe that day was so great. Val and Todd speculated that these recordings are the best Beam Reach has ever gotten. Here are a few short clips. What a great feeling. We all could walk back on to land with our whale fix. Looking back we have had some great once in a lifetime whale encounters. They have by no means been numerous, but have led us to our motto, “when we see whales, we SEE whales”. Our first day, we spotted transients through the Lime Kiln Lighthouse window, a fluke to say the least. It continued with our literally unbelievable Minke whale breaching. Several days before seeing our beloved J-pod, we stumbled upon two humpbacks. They were an unexpected surprise to our morning. We have been told humpbacks in Haro Strait are rare. Seeing these two off of Kellet Bluff breach and pec slap repeatedly was nothing short of amazing. The truth is that billions of us live on this small blue planet with millions of other species. Even 90% of the cells in our own bodies are other species…. Next time you feel lonely, go meet another species of this world, they’re all around us and they have much to say. I have never met another species I didn’t like and they are usually more like us than they are different. They dream like we do, they are made of the same stuff as we are, they think and feel, they play… and they are all so very present. Each one has so much to teach us and we know practically nothing about 90% of the species on this planet. Begin your discovery today and I promise you’ll not regret it. Start by watching the bugs, the birds, your dog… watch them just be. Then go to the park or the forest or a reef and look for them, they are waiting for you. We are not, nor have we ever been, alone. Who needs a roller coaster when you can go out on the water? At first this wave action was despised and sent most running for ginger and soda crackers, but now we have gotten used to it and say, “Bring it on!” On this particular day I was cold (actually most days I am cold), so I moved up to drier ground. Mandy was a champ and faced the waves as each one rose through the net. Several times I thought she was going to be swept right off the trampoline. Later, Kelsey joined her for the fun. Watching the two of them get doused with each wave sent Ally and I into laughter every time. Their faces were as unpredictable as the waves, luckily Val captured a few of them. Along with conquering waves, we have improved our sailing skills. We had a great day sailing. We each got to practice a tack. Check out this video of us in action. We also got a chance to experience each point of sail. 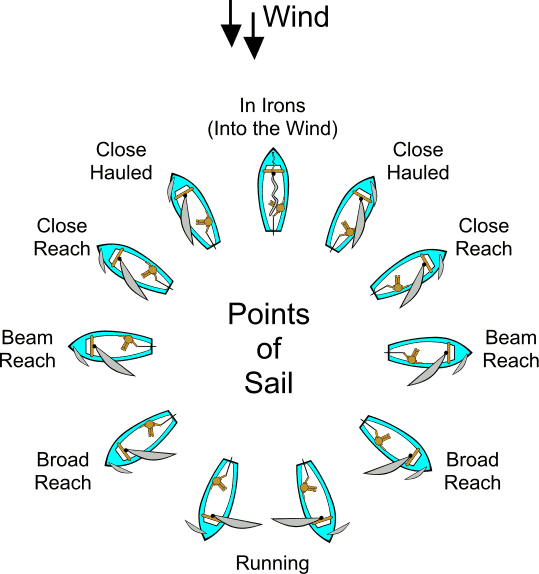 A close reach is the first range at which you can sail if trying to go against the wind. In this point of the sail we were hitting each wave head on which made for a more exciting ride. At a broad reach the waves are virtually undetecable and is one of the calmer points of sail. 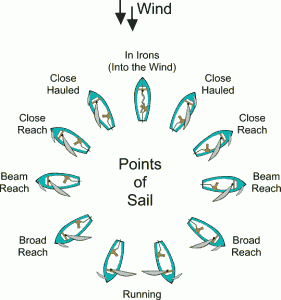 Did you know beam reach is the point of sail in which you travel the fastest?! Fitting name for the program. We are definitely speeding through things. It feels like so long ago since we got our first row boat lesson or our first lecture on the physics of sound. The information has definitely not stopped though. We have been trying lately to get a grasp on whale watch boat names and their operators, as well as parts of a boat and sailing terms. Our vocabularies have exponential expanded for sure! It is not all work though. When possible we look forward to walking along the beach or enjoying the sunset. We are definitely allowing ourselves to enjoy the simple things in life. The little unexpected things are those that seem to bring the most happiness. We have all enjoyed small care packages from our families, the random ice cream deliveries (THANK YOU CARLOS! ), and perhaps the most unexpected, a payment in prawns for allowing a neighbor to use our drill. I look forward to tackling more waves and enjoying the simple things on this grand adventure. Throughout our travels in the San Juans, we passed an island called Spiden. Todd said Spiden is unique because it originally belonged to two brothers who were taxidermists. They liked to hunt and stocked the island with all sorts of exotic deer. When we went by on our way to Patos Island, we were able to see a few of them. Todd told me that sometimes the deer swim to different islands and occasionally one will see a set of antlers making its way across the water. Last week we had a confirmed report that the elusive J-Pod came in through Discovery Island and had gone up Swanson Cannel into Canada. Normally, when they come to the islands, they go up Swanson Channel and down Boundary Pass or Presidents Channel. 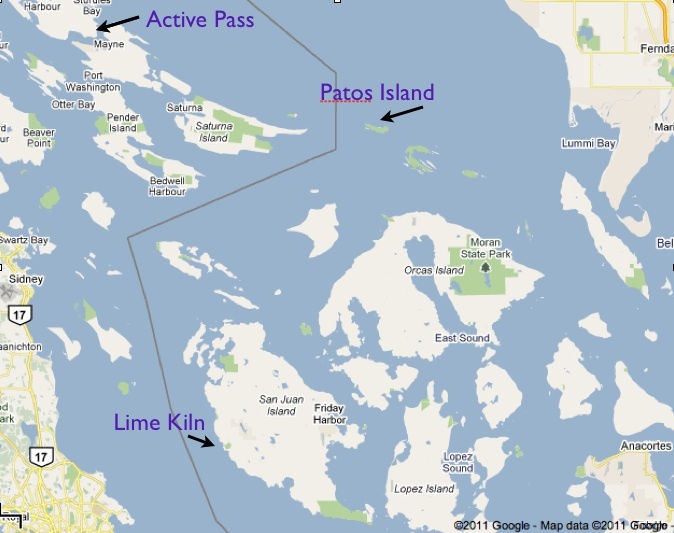 Taking the strategic approach, we decided to camp out near Patos Island where we would be at the fork of the two channels (see map). This way, we could be close and listen for them when they came back down. To ensure that they didn’t slip by us overnight, we did an anchor watch. For the anchor watch, we all took turns listening to the hydrophones overnight. My shift was from 12-1:30am. I unfortunately didn’t hear anything and neither did anyone else. As a result, we were up bright and early the next morning watching and waiting for J-Pod to hopefully come back down. Oddly enough, these tricky killer whales went back down the way they came in and we missed them all together. Oh nature. On the brighter side, Patos Island was amazing. It was very secluded and there were only two mooring buoys where we stayed. After dinner we went on a hike to the lighthouse where we watched the most beautiful sunset yet. On Mother’s Day we saw humpbacks! We spotted them early in the morning and had them all to ourselves. We arrived at the perfect time. 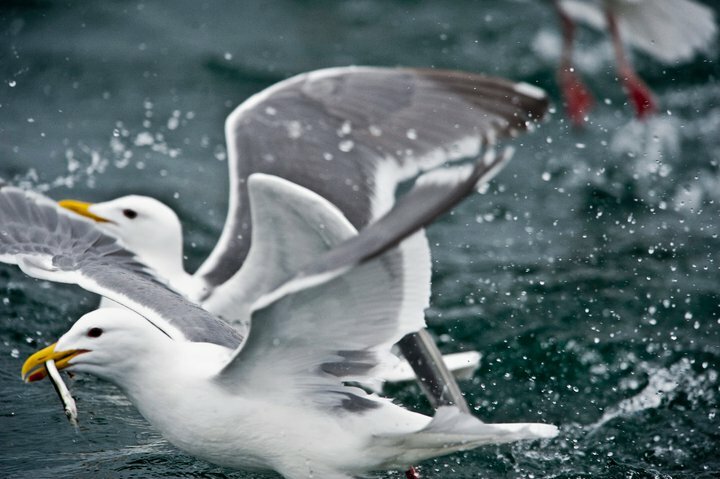 When we found them they were very playful, breaching and peck slapping, all right in front of us! They are massive creatures. A humpback whale can reach lengths of 48-63 feet and weigh up to 40 tons! There’s also a picture of us in Jeanie’s blog, here. We spent about an hour and half with them before we moved on to Salmon Bank to get plankton samples. 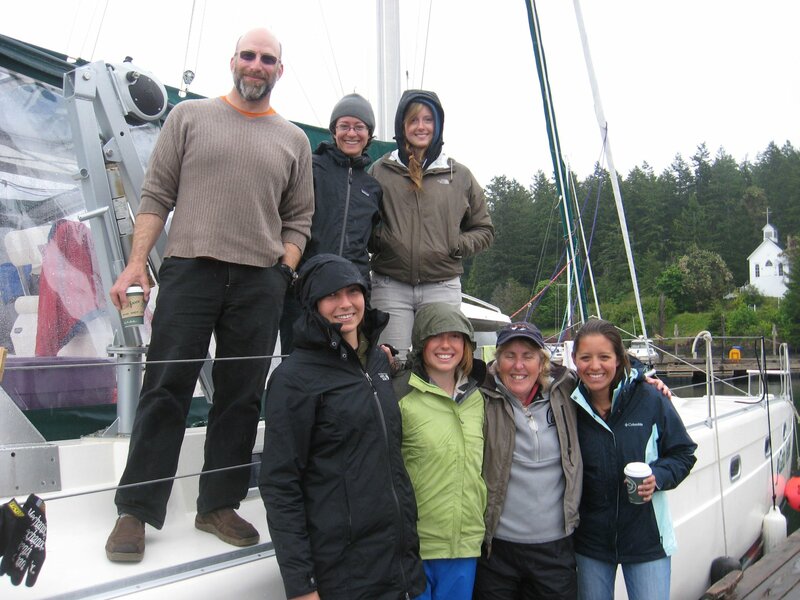 We also spent one day down on south Lopez looking at fish populations. 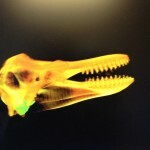 To assess the fish, we photographed sea birds and looked at what types of fish were in their beaks. This is difficult because the birds like to swallow the fish immediately. Luckily, Carols with his awesome photo skills, was able to capture a picture of a seagull with a sand lance in its mouth which was the fish that Kelsey was looking for to support her project. It was a successful day overall.